Another striking distinction between English and Russian cultures is the culinary traditions. 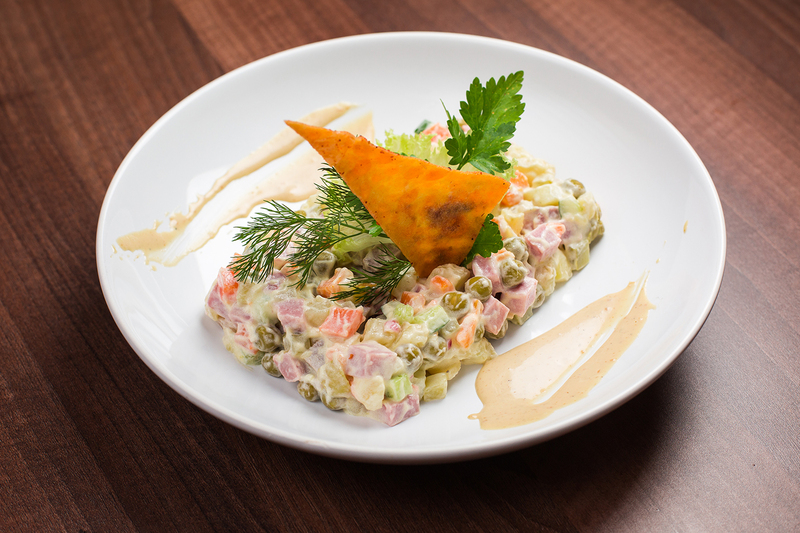 Russian cuisine is well-known for being deliciously tasty and very unusual to non-Eastern European cultures. It’s true, there are plenty of the national Russian meals that Englishmen would sell their souls to try again. On the other hand, some of the traditional Russian dishes can indicate very strange ingredients and look extremely unattractive to the English nation. Most likely, the majority would never-ever dare to try these culinary masterpieces. It’s an irreplaceable meal course for the New Years Eve. There’s a famous Russian saying, “If there won’t be a “Fur Coat” served, there won’t be the New Years Eve!”. This is how important this meal is for every Russian. 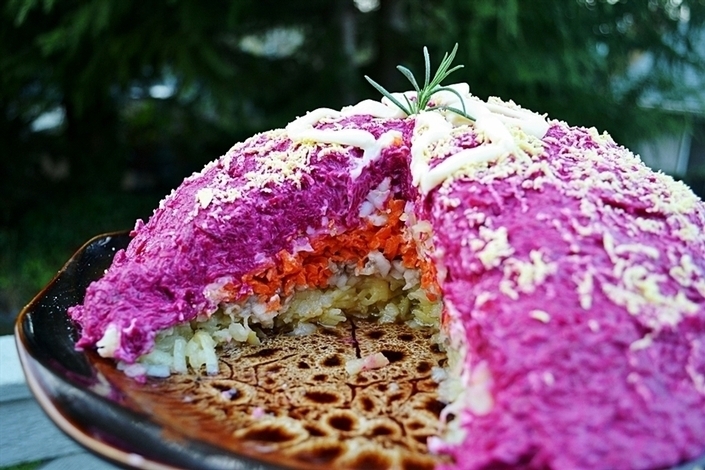 The “Coat” is covered with a beetroot shell, under which you will find a layer of egg and boiled carrot. The following layers will include smashed potatoes and onions. Beyond all the ingredients, of course, you are going to discover the sine qua non element of the dish – the herring! Although, this dish is not recommended to eat if you are sharing it with your other half. Kissing someone after this concoction will cause some inconveniences! 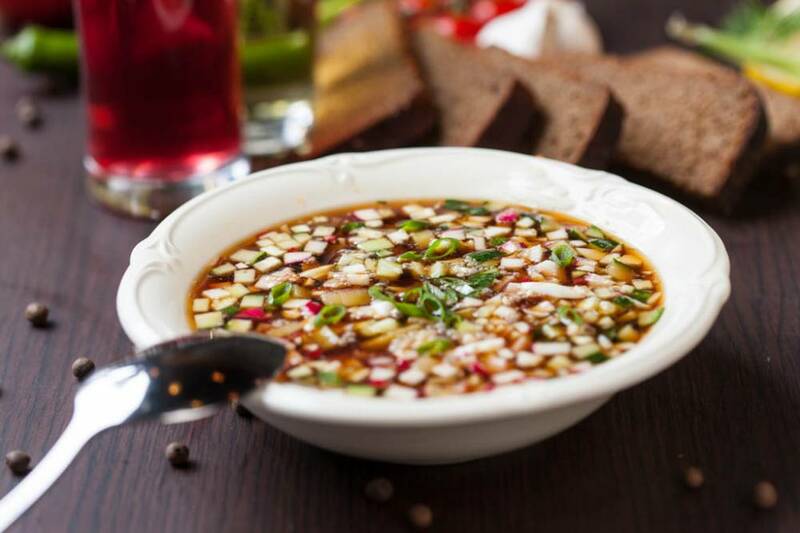 Okroshka is a traditional cold summer soup. Russians believe that there’s nothing better than Okroshka to cool down the body on the warm day. So instead of drinking beer, Russians prefer to take up a cool dish. The ingredients are; boiled potatoes, boiled eggs, radish, fresh cucumber, doctor’s sausage, mustard and sour cream, followed by the addition of bread juice. Alternatively, if you feel very panicked by the idea of adding a bread juice to the meal, use a kefir instead (a fermented milk drink). Kholodets is another Russian traditional winter dish. It’s a perfect appetiser to drink vodka with. That’s why you will always find it on the big Russian feast, and especially on the New Years Eve. 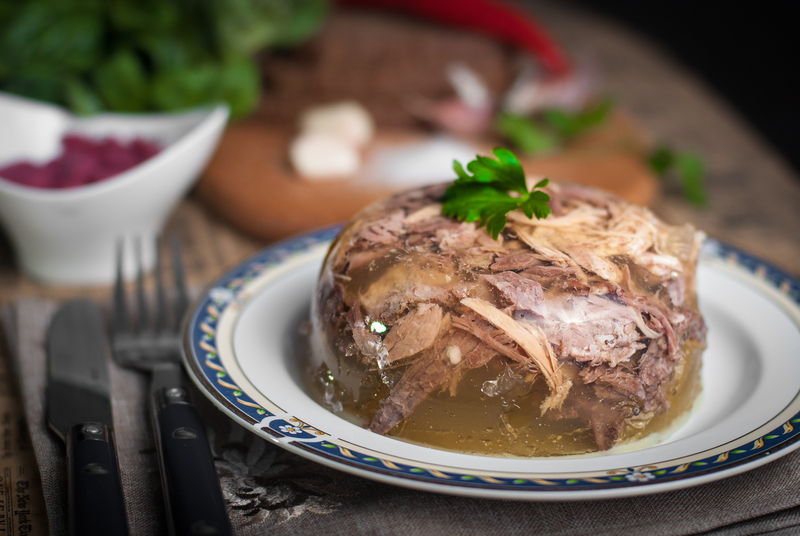 Kholodets it’s a jellied meat dish. To make it taste more acute, Russians usually eat it with either mustard, horseradish or with spicy adjica sauce. Again, if you have decided to kiss your special someone after eating Kholodets, you better watch out. Another irreplaceable meal course for the New Year Eve. To be served cold. For this simple work of art, Russians tend to chop doctor’s sausage, pickles, boiled potatoes, carrot, canned peas and finally, the ingredients are mixed together with mayonnaise. Girls, you better stay away from this meal. Mayonnaise is known for being an enemy for people trying to keep in good shape. Broadly known as “salo” across Eastern Europe. The best appetizer for vodka you could ever imagine. Usually being consumed with the traditional Russian brown bread (not brown English bread). It’s a traditional meal to have during the Russian males sauna sessions. 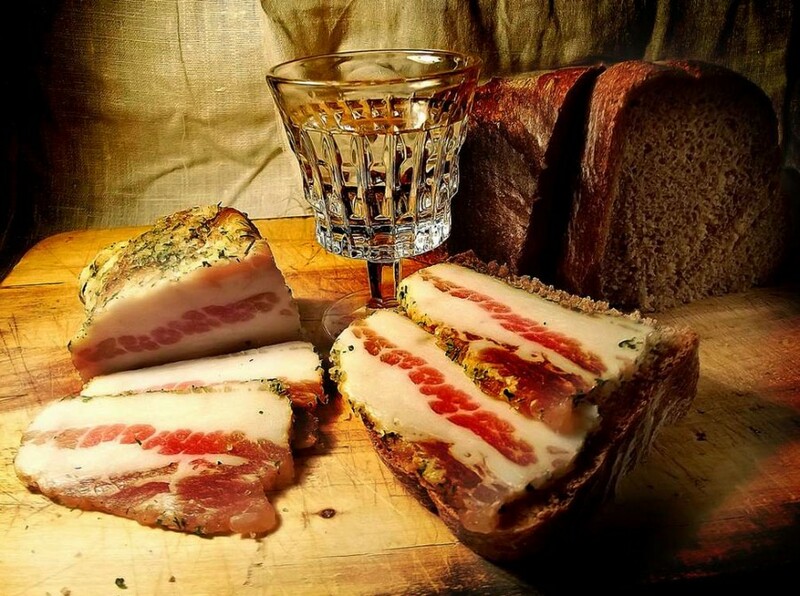 Basking, pig’s fat and vodka – all that Russian men need in their life. Indeed, some of Russian meals don’t look very appetising. Although, if the meal course doesn’t look appealing, this doesn’t mean it won’t taste delicious. For example, the traditional English black pudding looks no better than any of the mentioned Russian dishes above. Nevertheless, you will find plenty fans of black pudding in the UK, even though it looks like a scab. Don’t be a p*ssy and try Russian cuisine. Honestly, it tastes beautiful (providing you have a good chef), but you will need to grow some balls before you try it. Go for it! Oh, I appreciate a lot that you enjoy my posts! I believe then, that the Welsh people are more courageous than the English, ha-ha. I’m gratefully surprised, that you have actually tried those meals. Therefore, you won’t regret trying herring – Russians believe, it’s one of their the most remarkable dishes. By the way, I read your post yesterday. It must be your birthday today, isn’t it? And while I remember, I’m a Welshman, not an Englishman, if that makes any difference.